So, I’m sitting here in a hotel room in Sacramento, one day into a two-day conference. I’d been thinking about what to write since last week when Cece asked me to guest post, but after the day I’ve had, I’m changing direction. That’s the funny thing about blogging. You never know where it’s going to take you. I’m in Sacramento because I organize and run legal conferences around the country–about 24 each year. Usually, things go seamlessly (or almost seamlessly–it’s hard to imagine a completely error-free event). Occasionally, things don’t. Today was one of those days. Each mistake, on its own, is relatively innocuous. The conference room is moved and is difficult to find. But people find it and life goes on. We notice the printer left a section out of the materials. Okay. We can get Kinkos to deliver the missing section within hours. I take these mistakes pretty seriously. The speakers I line up for my conferences are leaders in their fields and the attendees have given us tuition and entrusted us with two full days of their valuable time, so I don’t like to disappoint. Of course, I can’t stop there. “Sorry” doesn’t mean I’m off the hook–it means I’m working harder than ever to get things back on track. But it’s a start to building a stronger relationship with our speakers and attendees. Believe it or not, some of my best evaluations have come from conferences that couldn’t catch a break. After all, it’s easy to represent your company or your brand when everything is going right, but it’s how you react when things go wrong that can set you apart. Tomorrow is day two and I think we’re in good shape, but wish me luck. 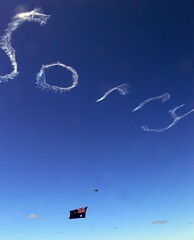 “Sorry” is a word often forgotten by PR pros and their clients who land in hot water. Your post serves as a reminder that often the best way to diffuse a situation is to admit it (apologize) and then move on to explaining the corrective action. Think of most of the recent corporate and political scandals. How long would they have lived had the CEO or politician said, “Yes, I screwed up and here’s how I’m going to make it better.”? Very true Alan. That simple word can have such a huge impact but so often we’re afraid to demonstrate what we don’t know and be seen as less than perfect. That’s probably why we appreciate it when someone apologizes. I remember a similar story. When I was planning an event for an influential Catholic charity the dinner had to be perfect. One day before the even, the rental company sent me the wrong tableclothes… they were POLKA-DOT! The client had specifically asked for light peach to match the color of the ribbons on her gifts. I apologized profusely for the mishap, and assured her that I would make it right. So I rushed out to the fabric store and purchased several yards of peach fabric. That evening, I stayed up until almost 2:00 A.M. ironing the hems and measuring for the right size tableclothes. The next day, the event went was a big hit and the client could not have been more pleased. My apologies, I say without irony – I neglected to leave my title.